Excellent Young Scholars of Natural Science Foundation of China (NSFC) (国家自然科学基金优秀青年项目), 2016. Excellent young scholar of Beijing (北京市青年拔尖人才), awarded by the Organization Department of Beijing Municipal Party Committee, 2015. Excellent young scholars in the special technology of national environmental protection (国家环境保护专业技术青年拔尖人才), awarded by the Ministry of Environmental Protection of P. R. China, 2014. 1000 talents plan for young scholars (青年千人计划), awarded by the Organization Department of the CPC Central Committee, 2013. New star program of science and technology supported by Beijing Metropolis (Beijing Nova Programme, 北京市科技新星), 2013. Distinguished young scholars of Beijing Forestry University (北京林业大学杰出青年人才培育计划), 2013. New century excellent talents in university (NCET，教育部新世纪优秀人才), awarded by Chinese Ministry of Education, 2012. Chinese government award for outstanding self-financed students abroad (国家优秀自费留学生奖学金), awarded by Chinese Scholarship Council, 2008. Excellent student poster award, 11th Korea-Japan Symposium of Catalysis, 2007. Outstanding Master dissertation of Harbin Institute of Technology, 2005. Editorial board memeber, Advanced Composites and Hybrid Materials, 2017~present. Section editor (Capture, storage, and chemical conversion of carbon dioxide ), Journal of Energy Chemistry, 2018~present. Young scientist committee member, Journal of Energy Chemistry, 2017~2018. Associate editor, Science of Advanced Materials, 2016~present. Ever served as editorial board member for this journal during 2013~2016. Associate editor, Journal of Nanoelectronics and Optoelectonics, 2016~present. Guest editor, special issue of "CO2 capture and utilization" for Journal of Energy Chemistry, 2017. Guest editor, special issue of "C1 Chemistry—C1-Platform Chemicals as Cornerstone for a Sustainable Energy" for Catalysts, 2016. Lead guest editor, special issue of "Advanced Nanomaterials for Energy and Environmental Sustainability" for Nanoscience and Nanotechnology Letters, 2016. Guest editor, special issue of “Nanocatalysis and Its Applications” for Journal of Nanoscience and Nanotechnology, 2014. 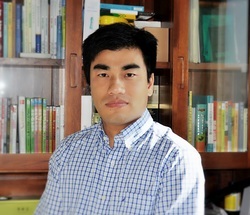 Organizing committee member, 4th International Symposium on Aqua Science, Water Resources: Resources and Environment, 14-16, August, 2014, Taiyuan, China. Academic committee member, 2nd International Congress on Advanced Materials 2013, 16-19 May, 2013, Jiangshu, China. Organizing committee member, The 19th Joint Annual Conference of CSCST-SCI, 15th September 2012, University of Reading, UK. Standing committee member, The Chinese Society of Chemical Science and Technology in the UK. Session Chair of "Energy and Resources" for the the 4th International Symposium on Aqua Science, Resources and Environment (ISASWR2014), August 14-16, 2014, Taiyuan, Shanxi Province, P. R. China. Session Co-Chair of "Composite Interfaces" for the 2011 annual meeting of American Institute of Chemical Engineers (AIChE), Oct. 16-21, 2011, Minneapolis, Minnesota, USA. Session Co-Chair of "Processing of Nanocomposites" for the 2010 annual meetingof American Institute of Chemical Engineers (AIChE), Nov. 7-12, 2010, Salt Lake City, Utah, USA. Session Chair of "Polymer Nanocomposites: Metals and other Nanoparticles" for theMinerals, Metals & Materials Society (TMS) 2010 annual Meeting & Exhibition, February 14-18, 2010, Washington State Convention Center, Seattle, Washington, USA. Nature Communications, Journal of the American Chemical Society, Energy and Environmental Science, Chemistry of Materials, ChemSusChem, Journal of Catalysis, Journal of Materials Chemistry, Environmental Science and Technology, Applied Catalysis B: Environmental, Applied Catalysis A: General, RSC Advances, Polymer, ACS Applied Materials & Interfaces, Catalysis Science & Technology, Scientific Reports, etc. Grant reviewer for ACS Petroleum Research Fund (PRF), European Co-operation in the Field of Science and Technology (COST), NSERC Strategic Partnership Grant of Natural Sciences and Engineering Research Council of Canada, and Natural Science Foundation of China (NSFC), etc.